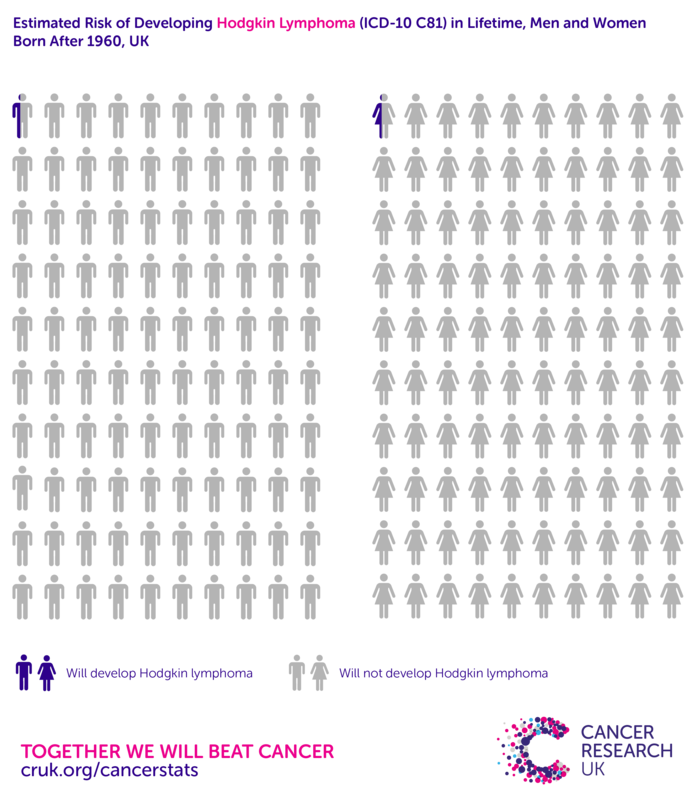 The estimated lifetime risk of being diagnosed with Hodgkin lymphoma is 1 in 360 (less than 1%) for males, and 1 in 505 (less than 1%) for females born after 1960 in the UK. These figures have been calculated on the assumption that the possibility of having more than one diagnosis of Hodgkin lymphoma over the course of a lifetime is very low (‘Current Probability’ method). Data is for UK, past and projected cancer incidence and mortality and all-cause mortality rates for those born in 1961, ICD-10 C81. Cogliano VJ, Baan R, Straif K, et al. Preventable Exposures Associated With Human Cancers. JNCI 2011;103(24):1827-39.
International Agency for Research on Cancer (IARC) classifies the role of this risk factor in cancer development. 40% of Hodgkin lymphoma cases in the UK are caused by Epstein-Barr virus (EBV) infection. Cogliano VJ, Baan R, Straif K, et al. Preventable exposures associated with human cancers. J Natl Cancer Inst 2011; 103:1827-39. Hjalgrim H, Askling J, Rostgaard K, et al. Characteristics of Hodgkin's lymphoma after infectious mononucleosis. N Engl J Med 2003;349(14):1324-32. Goldacre MJ, Wotton CJ, Yeates DG. Associations between infectious mononucleosis and cancer: record-linkage studies. Epidemiol Infect 2009;137(5):672-80. Hjalgrim H, Smedby KE, Rostgaard K, et al. Infectious mononucleosis, childhood social environment, and risk of Hodgkin lymphoma. Cancer Res 2007;67(5):2382-8. Among people with HIV, Hodgkin lymphoma risk is nearly 3 times higher in those with AIDS versus those without. Hodgkin lymphoma in HIV may be part of an immune reconstitution syndrome, whereby risk is higher in those who have enough functioning immune cells to ‘recruit’ to Hodgkin lymphoma development, but not enough to halt that development. The association with HIV may partly reflect increased Epstein-Barr virus (EBV) incidence in the HIV-infected population, though HIV/AIDS-related decreased immune function is thought to also impact Hodgkin lymphoma risk independently. Grulich AE, van Leeuwen MT, Falster MO, et al. Incidence of cancers in people with HIV/AIDS compared with immunosuppressed transplant recipients: a meta-analysis. Lancet 2007; 370(9581):59-67. Carbone A, Vaccher E, Gloghini A, et al. Diagnosis and management of lymphomas and other cancers in HIV-infected patients.. Nat Rev Clin Oncol 2014;11(4):223-38. Hodgkin lymphoma risk is around 3 times higher in first-degree relatives of Hodgkin lymphoma patients, a pooled analysis showed. Risk is higher when the affected relative is younger, and is higher in siblings of affected relatives (rather than parents), particularly males. Goldin LR, Pfeiffer RM, Gridley G, et al. Familial aggregation of Hodgkin lymphoma and related tumors. Cancer 2004; 100(9):1902-8. Hodgkin lymphoma risk is 3.2 times higher in people with rheumatoid arthritis compared with the general population, a meta-analysis showed. Simon TA, Thompson A, Gandhi KK, et al. Incidence of malignancy in adult patients with rheumatoid arthritis: a meta-analysis. Arthritis Res Ther. 2015 Aug 15;17:212. Cao L, Tong H, Xu G, et al. Systemic lupus erythematous and malignancy risk: a meta-analysis. PLoS One. 2015 Apr 17;10(4):e0122964. Apor E, O'Brien J, Stephen M, Castillo JJ. Systemic lupus erythematosus is associated with increased incidence of hematologic malignancies: a meta-analysis of prospective cohort studies. Leuk Res 2014;38(9):1067-71. Fallah M, Liu X, Ji J, Försti A, Sundquist K, Hemminki K. Hodgkin lymphoma after autoimmune diseases by age at diagnosis and histological subtype. Ann Oncol. 2014;25(7):1397-404. Kristinsson SY, Landgren O, Sjöberg J, et al. Autoimmunity and risk for Hodgkin's lymphoma by subtype. Haematologica 2009;94(10):1468-9. Hodgkin lymphoma risk is 10-15% higher in ever-smokers, compared with never-smokers, meta- and pooled-analyses have shown. [1-3] The association may be limited to current smokers,[2,3] with a dose-response effect. [1,3] It may be limited to, or stronger in, men and older patients. [2,3] Among current smokers the association may be limited to mixed cellularity and Epstein-Barr virus (EBV)-positive classical subtypes. Sergentanis TN, Kanavidis P, Michelakos T, et al. Cigarette smoking and risk of lymphoma in adults: a comprehensive meta-analysis on Hodgkin and non-Hodgkin disease. Eur J Cancer Prev 2013;22(2):131-50. Kamper-Jørgensen M, Rostgaard K, Glaser SL, et al. Cigarette smoking and risk of Hodgkin lymphoma and its subtypes: a pooled analysis from the International Lymphoma Epidemiology Consortium (InterLymph). Ann Oncol 2013;24(9):2245-55. Castillo JJ, Dalia S, Shum H. Meta-analysis of the association between cigarette smoking and incidence of Hodgkin's Lymphoma. J Clin Oncol. 2011;29(29):3900-6.